The tour stops in Philly, we check in. Microsoft is touring the USA showing off the Xbox One at various stops around the country. Access to the shows are free, though space is limited. Yesterday in Philadelphia we attended one of these stops to get some hands on time with the next-gen system. Luckily for us there was no wait to get inside and we got plenty of hands on time with the system and games. 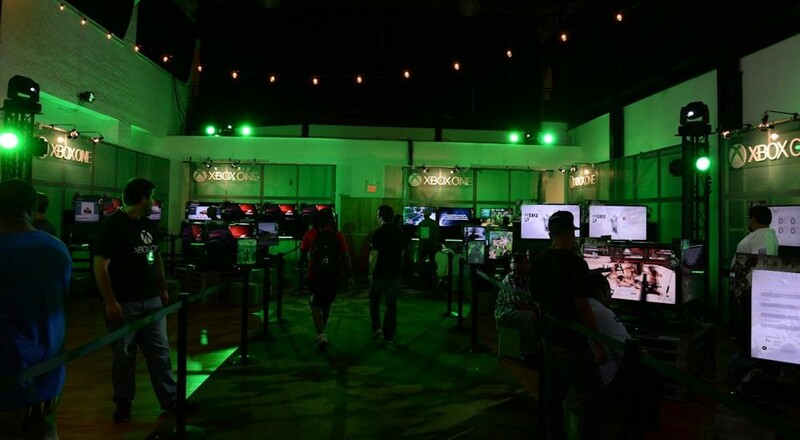 There was a limited showing of titles available to play from the launch lineup - Forza 5, Dead Rising 3, Killer Instinct, Loco Cycle, Ryse: Son of Rome, and a few others were on display. We walked in the door and hopped right into a match of Killer Instinct. We’ll break down some quick impressions of games first and then have separate more detailed impressions for the games we actually got to check out in co-op. A free to play fighting game seems like an odd choice for a launch title, but Microsoft is giving it a go with Killer Instinct asking players to pony up $5 for each character. Visually the game looks great with bright colorful textures and incredibly detailed character models. I played with Glacius, a character made of ice, and there were several facets to his body with jaggy chunks sticking out of every limb. The animations and combat felt smooth and as a fan of the arcade version of Killer Instinct 2 I felt right at home. The latest Forza game looks to take the series to new extremes in terms of real life accuracy. Tracks have been laser scanned into the game giving an almost 1:1 recreation of race areas. I raced around one of the tracks and while visually it’s not a huge step up over last gen, the environment feels much deeper and the damage model on the cars appear to be much more realistic over Forza 4. Perhaps the best feature of Forza 5 is one you can’t see and that’s using the Xbox One controller. The feedback provided by the rumble motors lets you feel the anti-lock brakes slipping, or your tires spinning out over loose ground. Every bump both subtle and exaggerated makes it feel as though you are in the car with a steering wheel in your hand. In a way it makes driving “easier.” We were told that in testing users were able to turn off visual and superficial driving assists because of the extra feedback supplied by the controller simply made driving more intuitive. Forza 5 will launch with a host of multiplayer modes online as well as two player split-screen support. The game also makes extensive use of driveatar technology - that is all AI in the game is created by your friends and the community providing feedback on how THEY drive in the game. Forza will then dynamically create AI based on that. I don't think fans of the series will be disappointed in this game at all. The most disappointing game of the showcase for me was Dead Rising 3. The limited demo area didn’t really give you much to go on in terms of the story or gameplay, but merely threw you in a zombie filled section of the game with a bunch of weapons to try. Sadly the combat felt a bit shallow, and while the sheer number of zombies was impressive, the quality of the zombies was not. They looked flat and almost low resolution. Their attacks felt stiff and the damage model didn't allow for any sort of dismemberment except in death. That said the promise a full open world where players aren’t tethered to each other in co-op sounds intriguing. The full game will feature drop-in and drop-out play as well. We just hope the combat feels a bit more satisfying in the final version. By far the thing that impressed us the most was the controller. As we mentioned in the Forza 5 section, the new rumble motors not only add to the experience, they simply feel more realistic. I’m anxious to see where and how developers use the feedback they provide to enhance other games. Honestly to call it “rumble” isn’t to correctly label how we saw it used, it really feels like an extension or subset of haptic feedback. Hands down this is the best gaming controller I've ever held.